U.S. Official: Beijing Preparing For 'Short, Sharp' War With Japan : The Two-Way A senior intelligence officer for the U.S. Pacific Fleet says China has been wargaming a conflict in the East China Sea that might center around the disputed Senkaku/Diaoyu island chain. 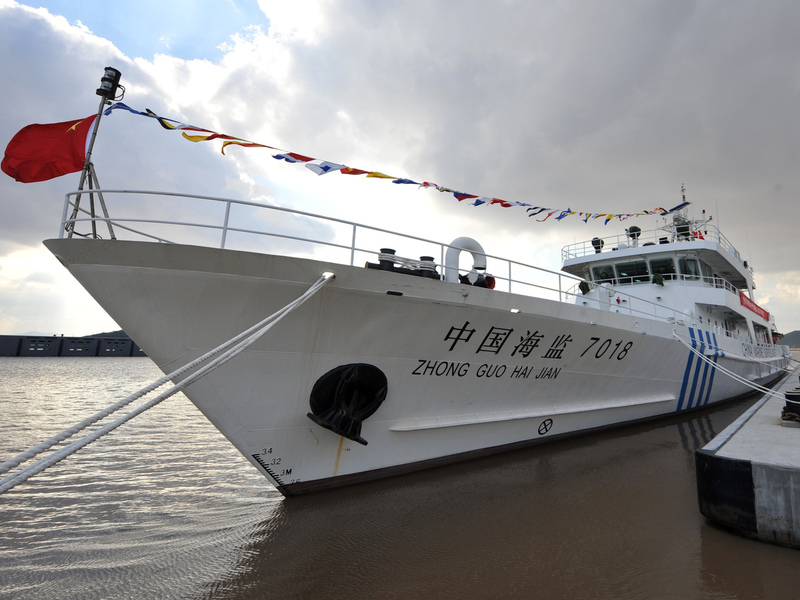 A ceremony is held to mark a new patrol vessel in service for China's marine surveillance in Zhoushan, east China's Zhejiang Province, last month. China is stepping up war games in preparation for a possible conflict with Japan over the Senkaku/Diaoyu Islands, a tiny island chain in the East China Sea claimed by both Beijing and Tokyo, a senior U.S. Navy official says. Captain James Fanell, deputy chief of staff intelligence and information operations for the U.S. Pacific Fleet, made the remark at a conference put on by the U.S. Naval Institute in San Diego last week. Fanell said that after witnessing China's Mission Action 2013, a "massive amphibious and cross military" exercise that included ground and naval forces of the People's Liberation Army, U.S. analysts had concluded that "the PLA has been given the new task to be able to conduct a short sharp war to destroy Japanese forces in the East China Sea following with what can only be expected [as] a seizure of the Senkakus or even southern Ryukyu [islands]." 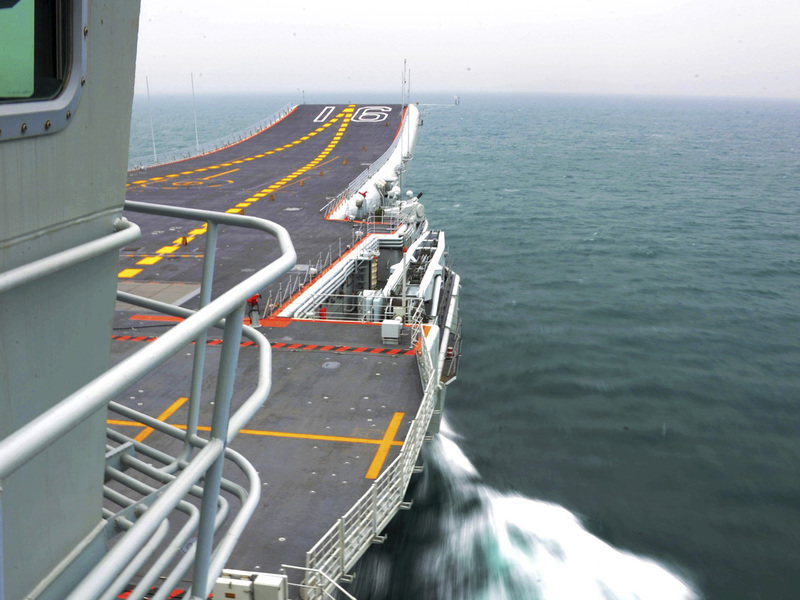 Beginning in the second half of last year, China's military training shifted toward what appears to preparation for "realistic maritime combat," he said. China's first aircraft carrier, Liaoning, cruises towards a military base in Sanya, Hainan province, in an undated picture made available in November. Just a week after Mission Action 2013, "Japan said that a Chinese warship locked its fire-controlled radar onto a Japanese warship. China denied it for a month, but then admitted that it occurred, but said that it was not in danger since the range between the two ships was too close for a weapons system," Fanell said. "Seriously, you just can't make this stuff up," he added. Beijing, Fanell said, conducted nine operations in the western Pacific meant to "practice striking naval targets." [Add at 3:20 p.m. ET: Pentagon spokesman Rear Admiral John Kirby declined to comment on whether it was appropriate for Fanell to publicly offer such a blunt assessment, but said the Pentagon wanted closer ties with China's military, Reuters reports. "Those were his views to express," Kirby told a Pentagon news conference on Thursday. As we reported at the time, China in December declared an air defense identification zone over the East China Sea, which the U.S. and many other countries in the region have refused to officially acknowledge. The zone angered Japan but was in line with a tougher stance taken by China's President Xi Jinping. Many analysts believe China aims to establish itself as the undisputed power in Asia by enacting something in Asia akin to the 1823 Monroe Doctrine issued by the U.S. warning European powers to stay out of the Western Hemisphere. "Although Capt. Fanell's remarks were unusually blunt in their assessment of China's intentions, they represent a growing tide of anxiety from senior US officials about Beijing's ambitions in both the East China Sea and South China Sea." "Earlier in February, Danny Russel, the US assistant secretary of state for East Asia, warned 'there are growing concerns that this pattern of behaviour in the South China Sea reflects incremental effort by China to assert control over the area.' He said that China's recent actions had "created uncertainty, insecurity and instability in the region." "For the past 20 years China has been undergoing a rapid ­military build-up, and the navy has been given pride of place. More important, China has been investing in its navy in a very specific way. American strategists sometimes talk about a Chinese 'anti-navy' – a series of warships, silent submarines and precision missiles, some based on land, some at sea, which are specifically designed to keep an opposing navy as far away as possible from the mainland. The implication of the investment plan is that China is trying to prevent the US Navy from operating in large areas of the western Pacific. According to Dennis Blair, the former Pacific commander who was head of the US intelligence services early in the Obama administration: 'Ninety per cent of their time is spent on thinking about new and interesting ways to sink our ships and shoot down our planes.'" "It's China vs. the Philippines and Taiwan for control of Scarborough Shoal; Taiwan also claims the Pratas Islands and (along with Vietnam) the Paracel Islands and the Macclesfield Bank, which the Philippines also claims; the Spratly Islands are claimed by Taiwan, Vietnam, Malaysia, the Philippines and even the tiny sultanate of Brunei. These disputes involve an area known as the 'cow's tongue,' which is roughly equivalent to the entire South China Sea." Fanell detailed a series of what he called aggressive actions taken by China against its neighbors over the past year. Some of those actions, including combat drills in the south Philippine Sea were described as China's "protection of maritime rights," USNI.org says. "By the way, protection of maritime rights is a Chinese euphemism for coerce seizure of coastal rights of China's neighbors," he said.